Top United Nations diplomats warned on Saturday that there could be no victory in the battle for the Syrian city of Aleppo without negotiations. “You can win a war but you can lose the peace,” said Federica Mogherini, the European Union’s foreign affairs chief, at a conference on the Mediterranean region in Rome. 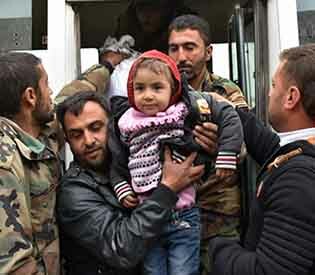 As of Saturday the Syrian army controlled more than half the rebel part of Aleppo after seizing overnight another sector in an offensive that has claimed more than 300 civilian lives and forced tens of thousands to flee the fighting. “If this is going to be an occasion for the government to say: we won the war, and therefore no need for negotiations, I hope not,” he said, adding that’s why he counts on “the influence of Russia and Iran” to convince Damascus to seek a negotiated solution to the conflict. The loss of Syria’s second city to Assad’s forces would be the biggest blow yet to Syria’s opposition in the more than five-year-old war. “Now it’s time for negotiation, but negotiating in real terms, which means power sharing… Otherwise, the alternative could be no major conflict but a creeping, ongoing guerilla (war) and no reconstruction,” de Mistura said.